The other Le Bon Truc Trio! Quite the week for music and the squeezy stuff. Three rehearsals in the space of seven days, preparing for three different gigs. The quintet Nouveau Chapeau is preparing for NEFFA, as mentioned in a previous post. 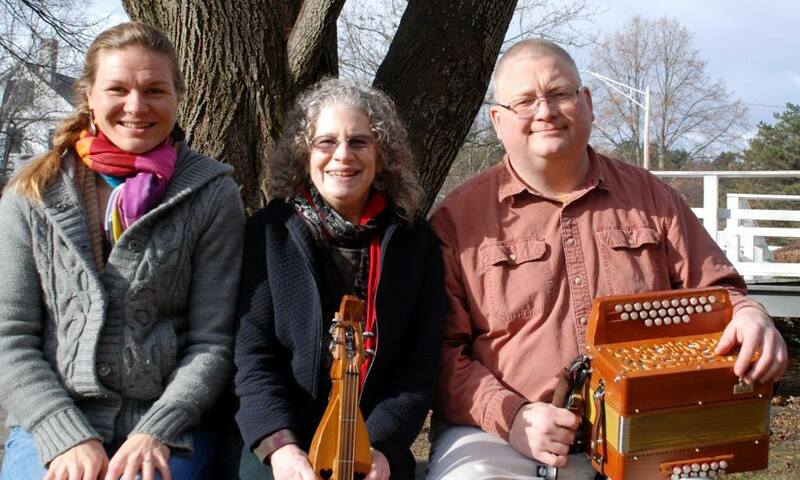 The Le Bon Truc Trio (with Steve on clarinet), is preparing for the Downeast Country Dance Festival (called DEFFA, but the acronym doesn’t quite seem to work). The other Le Bon Truc Trio (with Joelle Morris singing) is preparing for a performance at a French immersion school here in Maine. Because I take a phenomenological approach to the box — as should we all — I enjoy sharing my process warts and all. Barbara Truax (Le Bon Truc plectrist and percussionismo) recorded our rehearsal this Saturday. It’s embedded above, and you can hear us — having not played for a year — finding our way back into collaboration. It’s clunky at moments, but it was really a good time. Enjoy. 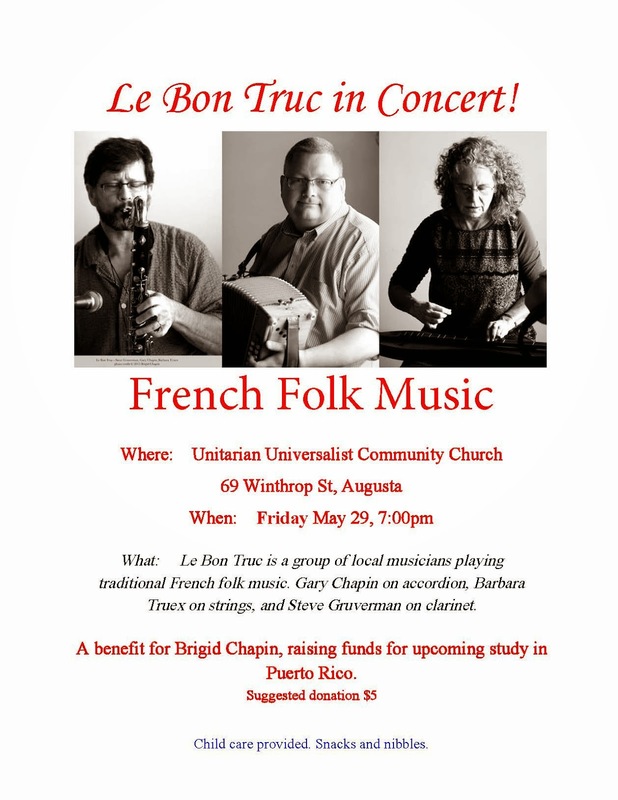 On May 29, Le Bon Truc Trio (Steve Gruverman, Barb Truex, and myself) presented a concert at the Unitarian Universalist Church in Augusta, Maine. Barb recorded the evening and it came out great! So, I’ll be posting those recordings sur le blog. Here are two waltzes, each composed by a band member. Saturday Night in St. Andrew is a beautiful waltz composed by Barb Truex. 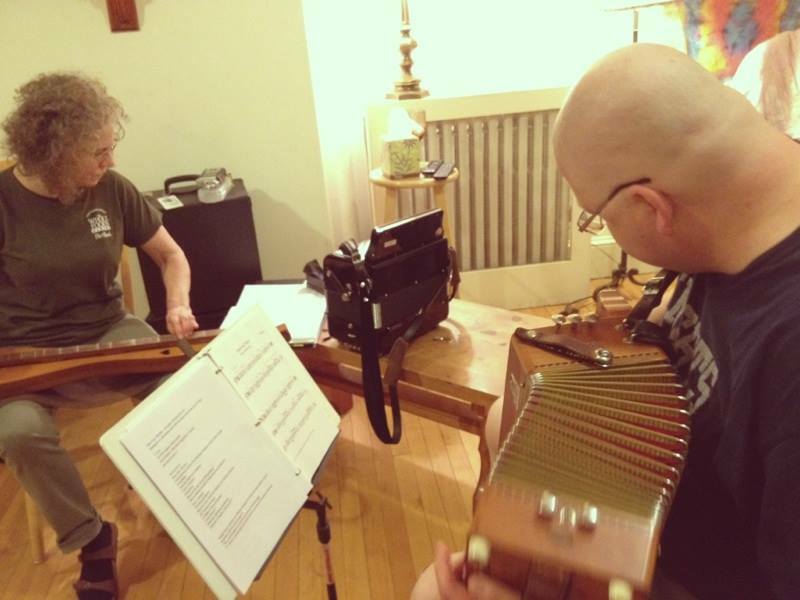 The dulcimer is well featured, but the accordion comes in and the trio as a whole really shines. Dill Waters Run Steep is a fast waltz I wrote many years ago, but which I still find very fun to play. People who haven’t been playing it for fifteen years seem to find it intriguing. Notice that I’ve left in the false start. It goes on for quite a while as I try to get back on the rails. Finally, I bring the festivities to a halt and restart. Just a little bit “you were there” verisimilitude! The trio rehearsed today and sounds pretty dang sweet. Come on to Augusta. Listen to some beautiful music, in a beautiful space. And eat pastry. Donations go to my daughter to help her in her studies abroad.